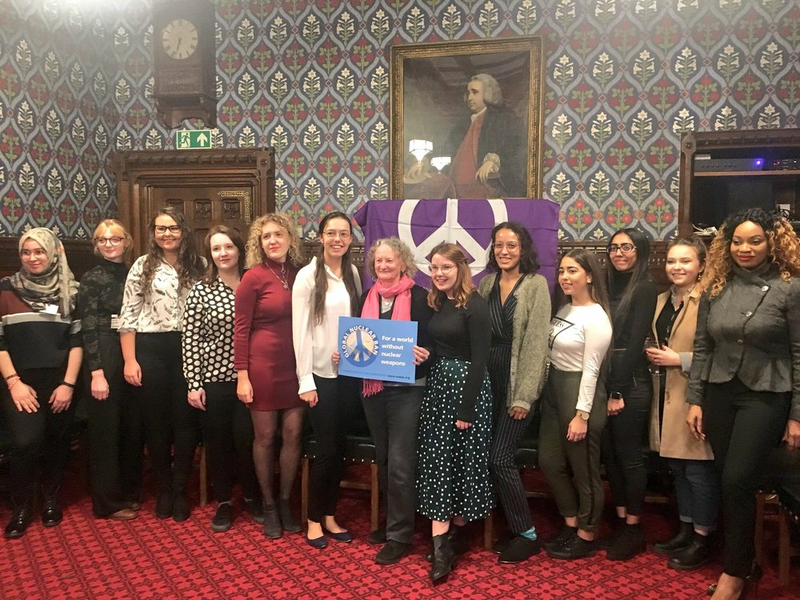 On Monday, Parliament’s Jubilee Room was filled with enthusiastic young activists from London universities, come to hear from our vice-presidents about getting involved with London CND. We were kindly hosted by Catherine West MP, who spoke alongside Jenny Jones and Bruce Kent about their support for the Campaign for Nuclear Disarmament. The event was attended by students from universities including University College London, University of the Arts London and Pearsons Business College, as well as Catherine West’s alma mater, the School of Oriental and African Studies. It was a great opportunity for students to meet other activists, and find out about starting their own university CND societies with the support of London CND. Before the drinks reception, a small group of students was given a private tour of the House of Lords by Jenny Jones, Baroness of Moulsecoomb, who is another of London CND’s vice-presidents. You can see more photos from the event on our facebook page. We pleased to announce that three well-known Londoners – Bruce Kent, Jenny Jones and Catherine West – have agreed to take up honorary positions as our Vice Presidents. They will be helping attract support and increase interest in nuclear disarmament among Londoners in the months ahead. Bruce Kent needs little introduction. Ordained as a Roman Catholic priest in 1958, Bruce became a monsignor before he left the priesthood in 1987 to take a more active role campaigning on some of the issues closest to his heart. Our ‘meddlesome priest’ was already a prominent opponent of nuclear weapons, as CND’s General Secretary from 1980 to 1985, then Chair for three years, and nowadays Honorary Vice President of CND UK. In his spare time you’ll find him speaking at public meetings big and small across the capital and beyond. Jenny Jones settled in London in 1991. By way of contrast, Jenny had a wide range of jobs before rising to political prominence – from mucking out horse stables, through crafts teacher and office manager, to qualified archaeologist. A former Chair of the Green Party, she’s best known in London for her role as an elected member of the Greater London Assembly and as Deputy Mayor of London in 2003-4. 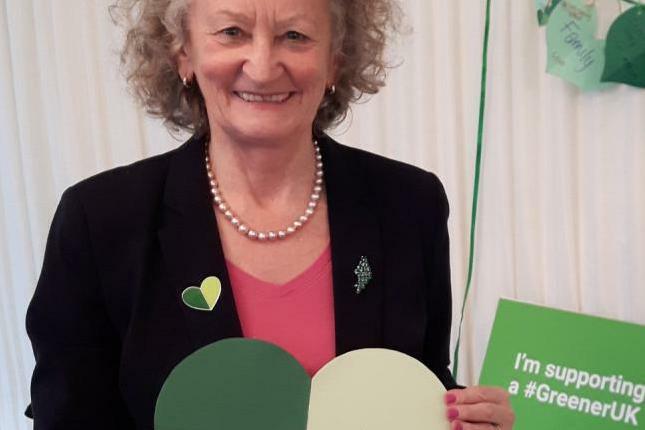 Nowadays Jenny is Baroness Jones of Moulsecoomb, the first Green Party representative in the House of Lords from where she continues to campaign on the dangers of climate change and the need to reduce greenhouse emissions. Jenny took her title from the Brighton council estate she grew up on, she tells us, and despite becoming a peer of the realm has no car and still grows her own vegetables. Catherine West is MP for Hornsey and Wood Green, a former leader of Islington Council – and proof positive of London’s cosmopolitan character. Born and raised in Sydney, Australia, Catherine took her master's degree in Chinese politics at the School of Oriental and African Studies and worked for a time in Nanjing. As a China expert and Mandarin speaker, she’s served on Labour’s front bench as Shadow Foreign Office Minister with responsibility for Asia Pacific. Catherine is a Quaker, which perhaps helps explain her trenchant opposition to Trident and frequent appearances on CND platforms. She also keeps a wary eye on UK arms sales from the benches of the Select Committee on Arms Export Controls.